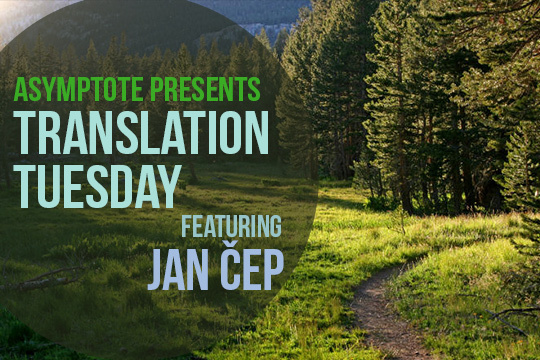 Today we’re thrilled to present a story by Jan Čep, a Catholic Modernist whose stories depict characters lost both spiritually and geographically. Weaving together deep mysticism and delicate realism, his style of writing has earned him a reputation as one of the most distinctive voices in twentieth century Czech prose. That afternoon the house emptied out, the voices in the neighboring rooms fell silent, the wagon of a child stood overturned in the yard, and inside the half-open gate peeked someone’s goat. Clouds covered the sky and hills encircled the ravaged and vindictive countryside; the trails led nowhere and the steel surface of the pond shimmered with hostility. Petr Kleofáš left the house and set out on the first trail he found without meeting a single soul. On a marshy meadow with dry grass, stumps of old willows stood over black pools. Grey groves, blasted by the breath of age and death, bit maliciously into the barren hillsides. Past the pond on the other side, crooked roofs from the village hunched beneath the dismal sky.